The 2nd last race of the 2017 season at Saratoga Speedway on Saturday night saw two point champions crowned and two season track records set on the Schnitzer Steel Championship night for the Modifiedes and Bomber cars who were joined by a night of racing by the Road Runners and Mad Max cars. Oyster River’s Chris Beaulieu having already clinched the 2017 Modified points championship and his speedway best 7th put a stamp on his dominating season by winning the heat race then went out and won the 40 lap main event by 1/2 ahead of the 2nd place driver. Beaulieu grabbed the lead from Jeff May on the 10th lap and even with a caution flag restart on lap 24 he was able to pull away to capture the win ahead of Peter Mulion and May who earlier won the trophy dash. Campbell River’s Boston Larson went into Saturday’s racing with a 48 point advantage on Chad Taks and 101 ahead of Charlie Akerman in the chase for the 2017 Bomber car championship. Larson used a 2nd place finish behind Akerman in the main event and a win in the heat race to win his 2nd speedway championship ( he won the Hornet championship in 2014) and joins dad Darren 2015 and uncle Darrell 2016 as the Bomber point champion by finishing 59 points ahead of Taks and 85 ahead of Akerman. The two new season track records were set first by Road Runner driver Ryan Guest with a 18.97 lap then Akerman posted a new lap time in the Bombers with a 17.2 and being that the records for track records based on rule changes aren’t available the records are based on the best laps of the 2017 season. In Road Runner racing Guest boosted his class leading point total to 116 points as he attempts to capture his 3rd straight championship and did so by winning the heat race and main event. In Mad Max racing Toryn Davies came away with the win in the heat race and 25 lap main event while point leader Danielle Antonik built her point lead to 128 over Damon Dunn. The 2017 season comes to a end this Saturday night as Kite Delivery presents championship night for the Hornets, Mad Max, Road Runners and Crash to Pass with only one class having their point championship clinched. The Hornet A’s has Carter Hintz with a 245 point lead on Luke Dixon a total that cannot be overcome giving Hintz the championship. The Hornet B’s have the closest battle of all 8 classes as only 61 points separate point leader Jimmy Antonik, Randi Joyce, James Laidlaw and Evan McLuckie making their last main event of the season looking to be deciding the 2017 champion. While Guest 116 ahead of Austin Hack and Antonik’s 128 point lead over Dunn favors the two drivers but with racing being a anything can happen sport their championships more than likely will be based on their qualifying and heat race results. The final points battle comes in the Crash to Pass class as Troy Ordano has a catch able 70 point lead on Rich Hutton while Scott McLellan will have to take advantage of some breaks to catch Ordano as he sits in 3rd140 points back. 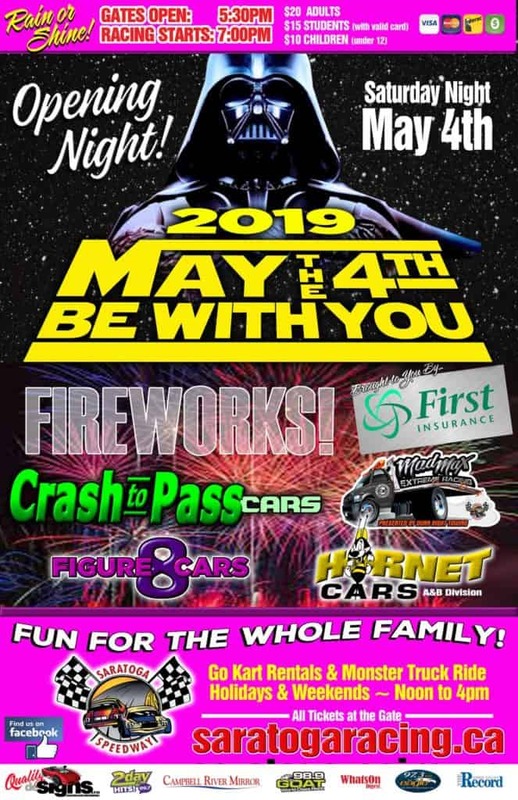 This Saturday night will be a rain or shine event and with the fire ban lifted the 2017 season while end with a speedway trademark fireworks show. while the last race of the season will be the popular Great Pumpkin race where every possible car in all classes will have a pumpkin on their hood and the last to not fall of is the winner. This weekend is the last weekend for the Go Karts and monster truck rides.